Leo Scullion says the World Championship final is "the pinnacle of any referee's career"
Cancer survivor Leo Scullion "couldn't be any happier" after being chosen to referee snooker's World Championship final for the first time. The Scot, who has been a referee for 20 years, had lung cancer but it has been in remission for almost five years. 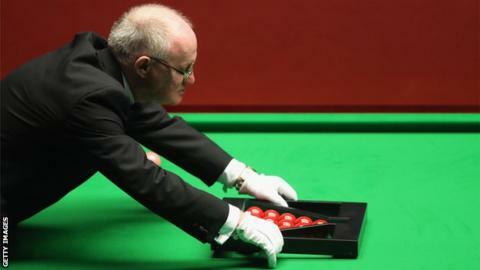 The tournament at Sheffield's Crucible Theatre starts on 20 April, culminating in the final on 5 and 6 May. "It's fantastic, absolutely fantastic, it has to be the pinnacle of any referee's career," Scullion said. The 60-year-old was forced to take a break from refereeing while he underwent treatment, including two cycles of chemotherapy, before returning in 2016. Since then, he has been in charge of the final of the Scottish Open on two occasions. He was also in the middle for Mark Williams' 17-15 win over Barry Hawkins in the semi-finals at the Crucible last year. He said: "In those dark days, I suppose one of the things that would've been on my mind, although not immediately, was would I ever be back refereeing never mind being chosen to do this? "I've obviously been very lucky; somehow I've managed to come through the health part of it. And, through walking and doing a bit of cycling, trying to do a bit of fitness just for my own personal satisfaction, it's allowed me to be back refereeing. I couldn't be any happier." And he said of the day of the final: "In the morning, I will be in bits. I'll probably wake up at the crack of dawn if I manage to get to sleep the night before at all. As soon as the match starts, I'll be fine."